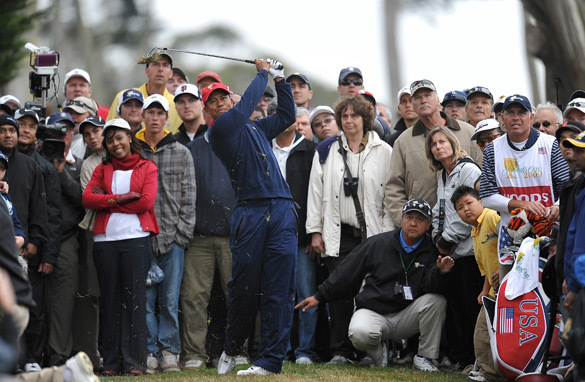 There was a time when Tiger Woods, by comparison in the build-up to his appearance in stroke play events, never really rated a mention as a big threat in the Ryder Cup –- his performance was always below par in team events. Tiger Woods finally became a team player in the Presidents Cup. The discussion was mostly about why he hadn’t clicked in the team format. Not anymore! He whacked the Internationals in the Presidents Cup by pocketing maximum points – or going 5 and O as they say at the bar in the clubhouse. I was at a Ryder Cup "Year to Go" function in October at the Celtic Manor where European captain Colin Montgomerie and USA captain Corey Paven shared some time together to asses the course. They spoke a day after the USA retained the Presidents Cup and of course Tiger’s name came up. “Yeah that’s great news for us that he’s finally worked out the team game,” Monty said with a wry smile. You might take that as a defeatist attitude but I think Monty will be happy to let everyone focus on talking Tiger up, while I don’t think he’ll be too concerned for several reasons. Even if Tiger is in top form the circumstances at the Celtic Manor will be vastly different than the set up in San Francisco for the Presidents Cup. The obvious is the crowd – we know it will be in favor of Europe, that’s a big factor on its own. From what I have seen the layout of the Celtic Manor will make for a cauldron atmosphere because of the elevation around various holes. The crowd will have a bigger hand in this result than other European Ryder Cup venues. Throw in more variables like many European players knowing the Celtic Manor course as its featured as a venue for the Wales Open before. And then throw in a dose of some Welsh weather. In October next year it will be cold, often very cold and probably wet, not something US players generally deal with or like a lot. It takes a lot to tame Tiger, Monty knows that, but he also knows he’s got a few more things going in his favour being on home soil.